This is the final installment of the "fraud breakers" flavor review, continuing from Demara and Lustig. This card's name refers to Frank Abagnale, an American security consultant known for his history as a forger and impostor. His past identities include airline pilot, physician, U.S. Bureau of Prisons agent, and a lawyer, though he claims to have assumed at least 8 roles in his time. After his eventual capture, he served time in prison before starting work for the federal government. He currently works for the FBI, as well as running a financial fraud consultancy company. His first con took advantage of his father, who had given him a credit card for gasoline and a truck to help Abagnale commute to his job. At only 15 years old, he used the credit card to buy tires, batteries, and other items, and would then return them for cash. In the end, his father owed $3,400 on the credit card. He was also involved in bank fraud, writing checks that would overdraw his accounts. To keep this going, he would open new accounts with different identities. He would also print forgeries of checks, convincing banks to advance him the money for them. Finally, he would print his account numbers on bank deposit slips, distributing them among real deposit slips. Any customers that used these fraudulent slips were actually depositing money into Abagnale's accounts. He also got into the habit of scamming businesses that used bank deposit boxes. Utilizing a security guard's outfit, he would place an "out of order" sign on the deposit box, with instructions to leave deposits with the on-duty security guard. Funnily enough, he later expressed amazement that this worked, saying, "How can a drop box be out of service?" Later, desiring to travel the world for free, he contacted Pan American World Airways, claiming to be a new pilot whose uniform was lost by hotel staff. The company provided him with a new uniform, as he produced a fake employee ID and Federal Aviation Administration pilot's license. Between the ages of 16 and 18, it is estimated that he flew 250 flights and visited 26 countries, also staying at hotels for free due to his employee status. This is also the source for the card art, as it depicts a plane. After a close call in New Orleans where he was nearly arrested, he took on the role of supervising physician in a Georgia Pediatric clinic. Listing his occupation as "doctor" on a rental application, he soon befriended another doctor in the building who offered him the position until the local hospital could fill the role. As a supervisor, he wasn't involved in actual medical work, but he eventually left, not wanting to risk endangering someone's life. During another time posing as Pan Am First Officer "Robert Black," at just age 19, Abagnale forged a law transcript from Harvard, passed the bar exam, and found employment with the Louisiana State Attorney General's office. He says this was possible because Louisiana allowed applicants to retake the bar unlimited times, which allowed him to merely correct what he had previously gotten incorrect. However, after a real Harvard graduate in the same office began investigating Abagnale's background, he left to seek other opportunities. He was eventually arrested in 1969, when an old flame recognized him and reported him to authorities. At the time of his arrest, 12 countries in which he had committed fraud sought his extradition. He served 1 year in inhumane conditions (no clothes, toilet, mattress, or blanket, with limited food and water) in France, before being extradited to Sweden, where he served 6 months. After this, he found he was to be tried in Italy, but as a Swedish judge had revoked his passport, the government had no choice but to deport him to the U.S., where he served 12 years. However, his prison time was marked by several escapes, including once being mistaken for an undercover prison inspector (due to misplaced paperwork), and he convinced a friend to slip him a fake business card, identifying him as "Inspector C.W. Dunlap," working for the Bureau of Prisons. His friend then posed as an FBI agent, and they worked together to allow him to escape, albeit temporarily. His eventual release was part of a deal from the U.S. government, on the terms that he assist them, without pay, in investigating scams and con artist crimes. His past, however, would haunt him when seeking honest work upon his release. Eventually, he approached a bank, revealing his colorful past, and offering to advise them on scamming and fraud techniques. This worked in his favor, eventually leading to his current financial fraud consultancy company. Finally, the flavor text is an actual quote from Abagnale, believing that advancements in technology just make committing fraud and scams easier. 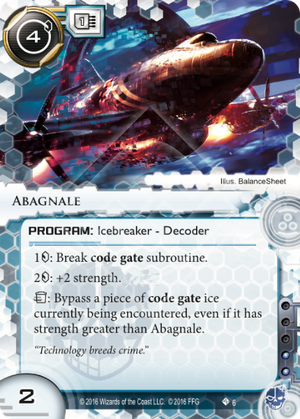 Abagnale, also known as "Criminals just got a good in faction decoder", is a rather obvious alternative to Gordian Blade. Is it worth slotting in your deck though? On the surface, the cards are nearly identical. Costs 4 to install, base strength two, 1 credit to break a subroutine. The major difference is that Gordian boosts per 1 credit, this boosts per 2. That means if your opponent is running a lot of strength 3 or 5 code gates, this will be marginally more expensive each time. 3 isn't too relevant (Aiki and Magnet are the only ones you might see sometimes) but there are plenty of nasty fivers which often see play, such as Fairchild 3.0, Tollbooth, Ravana 1.0 and Mausolus. There is also the slight caveat of Gordian Blade keeping its strength for the remainder of the run, so if your opponent happens to stack high strength code gates, you will be happy you run that over Abagnale. I am not yet sure whether the trash ability will be relevant. It could come in clutch if you are expecting to win that turn, but it seems like a huge investment. Criminals are not exactly known for recurring their breakers, and of course, there is Skorpios running around which makes this even riskier. All in all, I wouldn't put my Gordian Blades in a binder just yet (do they even go in there, isn't it a core set card? ), but for criminals who want to have more influence and a good decoder to back up their Passport, this is definitely a solid pick.